← Your Refrigerator’s Water Filter – Is it Time to Replace? In the great state of Arizona, it’s heating up near the 100-degree-plus temperature days of summer. And that means a lot more people are staying indoors in air-conditioned comfort. Air conditioners provide us with a lifesaver in the hot, dry months of summer. For those people living in Phoenix without access to a properly functioning air conditioner, summers can be downright dangerous. Staying inside home with no A/C would be an ordeal, filled with breezeless open windows, rotating fans and more. Sure, your electricity bills might be less, but at what cost? This is why those adventurous souls living in the Valley of the Sun need air conditioning in the summer months. But, imagine if your A/C unit has blown an air conditioner compressor, or a run capacitor has blown, or the fan has gone dead. Then what? Would you know how to replace your broken A/C unit part? Or would you have to call a local service repairman to the tune of several hundred dollars for a visit? That’s not what you want in the peak summer season. Arizona homeowners need to have a well-maintained air conditioning system. 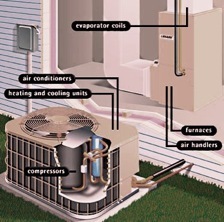 AC repairs are unavoidable; many break down due to constant use. Knowing where to locate parts that blow or burn out is a key consideration. That’s where Arizona’s own Appliance Parts Company can be your service provider in maintaining your air conditioning system. We offer a wide range of A/C unit replacement parts. As an appliance parts company for refrigerators, washing machines, dryers, ranges, dishwashers, and ice machines, we provide a lot more than just air conditioning repair parts. Appliance Parts Company works with leading manufacturers, including premium home appliances lines like Whirlpool, Amana, Jenn-Air, KitchenAid, Maytag, Electrolux, Frigidaire, General Electric, Kenmore, SpeedQueen, Thermador, Bosch, Gagganau, Fasco, and many more. Appliance Parts Company is the number one source for all appliance parts needs, carrying thousands of appliance parts for any and all major appliances, including your very necessary air conditioner. We’ll help you out with installation and maintenance tips, great prices and fast delivery. Click over to our easy to use web page for a centralized solution for locating the appliance part you need. Stay Cool! This entry was posted in Appliance Repair Parts and tagged A/C replacement parts, air conditioner parts, Air conditioning repair, Appliance Parts, GE air conditioner parts, premium home appliance parts, replacement parts for air conditioners. Bookmark the permalink.